For Ebrahim Moosa, the chance to develop an elite Islamic studies program at a Catholic university is full of opportunity. “Catholics and Muslims can potentially embark on a series of meaningful conversations on common concerns,” he said. “There are challenges both Catholics and Muslims face on gender issues, science, evolution, and values. How do strong religious values survive in the midst of formidable social and political challenges? Being Muslim on a Catholic campus hasn’t been a challenge, he said, because people of faith have many things in common. Some of his previous environments haven’t been so welcoming. His research began to garner increased attention while teaching at the University of Cape Town in 1997, and he accepted an invitation to spend a semester at Stanford University. When he returned to his native South Africa, he soon became a target of urban terrorism. At the urging of his Stanford colleagues, Moosa and his family quickly jumped on a plane and went back to California. After three years there, he moved to Duke University, where he taught until 2014. He came to Notre Dame following conversations with Scott Appleby, now the Marilyn Keough Dean of the University’s Keough School of Global Affairs. He invited Moosa to join him in co-directing Contending Modernities, the global research and education initiative examining the interaction among Catholic, Muslim, and other religious and secular forces in the world. Appleby also asked Moosa to develop academic offerings focused on Islam. 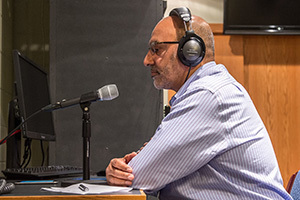 Moosa, who was recently interviewed by Al-Jazeera and participated in a panel discussion on NPR’s “The Diane Rehm Show,” primarily researches Islamic law, ethics, science, and values. 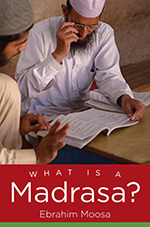 Moosa is the author of What is a Madrasa?, which focuses on post-secondary religious institutions in the Indo-Pakistan heartlands. In his book, he explains how a madrasa is a valuable place of learning revered by many and an institution feared by many others, especially in a post-9/11 world. Drawing on his own years as a madrasa student in India, Moosa describes in detail the daily routine for teachers and students today. He shows how classical theological, legal, and Quranic texts are taught, and he illuminates the history of ideas and politics behind the madrasa system. He also explains why the demonization of madrasas is an incorrect perspective held by many in the West. Moosa also is the author of Ghazali and the Poetics of Imagination, winner of the 2006 American Academy of Religion’s Best First Book in the History of Religions Award, and editor of the last manuscript of the late University of Chicago professor Fazlur Rahman, Revival and Reform in Islam: A Study of Islamic Fundamentalism. In 2005, he was named a Carnegie Scholar to pursue research on Islamic seminaries of South Asia. True to Notre Dame’s vision, the Islamic studies program Moosa envisions will have ample opportunities for service learning and study abroad. And consistent with Notre Dame’s Catholic character, it will also be of service to the American Muslim community.